Ever wondered how graphic tablets work? I have! So I did some research on the matter and I will try to explain how I understood what I’ve found. Graphic tablets with styluses that uses a battery. Graphic tablets with styluses that do not require a battery. Graphic tablets with a display that are also called Display Tablets (original, I know). Generally all of these types of tablets share a common ground. Their styluses emit electromagnetic signals, which are captured by the pad and then transmitted to the given device. That was just very, very basic explanation of how graphic tablets work, let me elaborate. The styluses have a digital chip, a transmitter and a modulator inside their cylindrical shape. 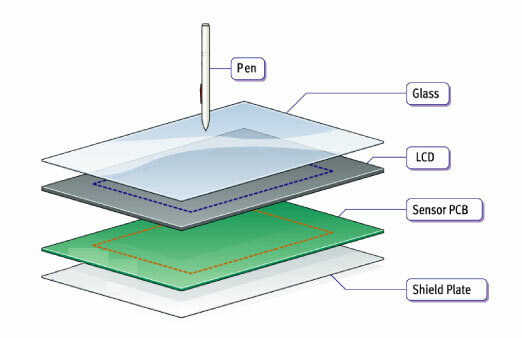 The tip of the stylus sends out a signal that is captured by the tablet surface which then gets sent to the computer where the tablet drivers determine where the pen is located, what it’s doing and so forth. The pad itself has a circuit board with multiple send/receive coils and a magnetic reflector, which on its part emits electromagnetic signals that capture the pen/stylus electromagnetic signals. The sending mode coils emit a signal to simply detect whether the those (coils) in the stylus are within range. The receiving mode is used to get information on the pen and that information is processed by the drivers on the computer to determine whether there’s applied pressure, tilt, speed, position, etc. That being said, the Graphic Tablets which use a battery are typically Bluetooth and have to be paired with the devices that usually do not have the pad technology mentioned above. Being Bluetooth gives them quite the versatility as they can work with almost any Bluetooth-enabled device that has a capacitive screen, but information such as pressure and tilt (if there is any) is basically handled by just the pen and the drivers/software installed. Which means that it’s not always that accurate. Bluetooth styluses are great but they don’t come without drawbacks, one example would be that most of them lack pressure sensitivity. That’s unless they specifically say they support pressure sensitivity. Out of all the Bluetooth styluses, it appears that the Apple Pencil has the best reviews so far. Personally using one I do also support that it’s great for drawing. The Apple Pencil has tilt detection, pressure sensitivity and is quite accurate in terms of positioning. Although Apple do not say what are the Pencil’s pressure levels, it appears that they’re more than enough for a sketch, doodle or a comic illustration. There doesn’t seem to be a parallax near the edges of the screen and depending on which software you’re using and the resolution of the canvas and brush size, there could be a bit of lag but it wouldn’t be enough to disrupt your workflow (unless you’re using maxed out brush on a 3000×3000 with 300 ppi canvas). I’ll give a bit more detail on display tablets below, however I’ll just note that the iPad Pro seems to have been designed for drawing in mind right from the very start and it’s not that they’ve decided to make it drawing compatible when thinking up what people could use it for. Graphic tablets without battery in the stylus are typically found in Wacom products. The brand’s target is digital 2D and 3D artists. The reason why Wacom’s styluses do not need a battery to power the pen is because their pads use technology built in that provides power to the pen through “resonant inductive coupling”. As a result, no batteries are inside the pen, making them lighter. Display tablets, the technology mostly remains the same, however any metal or other material parts that could disrupt the electromagnetic signals are covered up or if their own magnetic field is too great. In addition, there are components inside the casing of the tablet that are also found in computers, such as a processor, power unit, etc.